When they leaked the fifth season of Orange Is the New Black, I thought to myself, “Well, at least this hacker has good taste.” And yet I spoke too soon! For what was next on the mischief maker’s checklist but ABC’s unaired, upcoming gameshow Steve Harvey’s Funderdome. 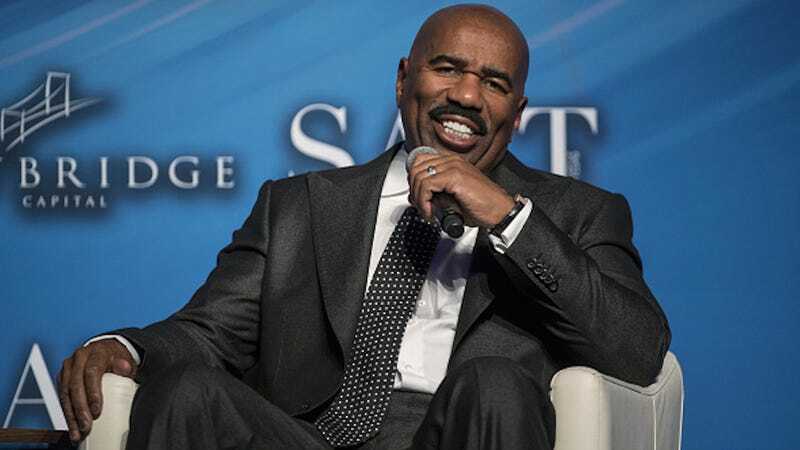 Singling out Steve Harvey programming, of all things? That’s a curveball if ever I’ve heard of one. As Vulture reports, the hacker made eight episodes of Steve Harvey’s Funderdome available on the torrent site Pirate Bay. Vulture also rightly observes that there is already a surplus of Harvey content to be had—why this impatience? But then, maybe this hacker knows something we don’t. Maybe this ambiguous “Funderdome” is comprised of wonders beyond our comprehension. Probably not, but you never know. The game show is being marketed by ABC as a Shark Tank—America’s Got Talent hybrid. Inventors and entrepreneurs will appear on the show with the aim of convincing the audience to fund their projects. And if you can contain your excitement for just a few more days, the show will premiere on June 11. If, however, you yearn to experience the Funderdome, it looks as if one hacker has you covered—that is, until they’re caught and the intellectual property is confiscated.